Prof. K.V.Thomas addressing the gathering. Sri I.Venkat and Smt. Ambika Soni are to his left. Advertising Standards Council of India (ASCI), a voluntary self regulatory body of the advertising industry, organised a one day seminar on "Strengthening Self Regulation of Advertising Content", at New Delhi. The seminar, which was inaugurated by Smt. Ambika Soni, Union Minister for Information & Broadcasting, was addressed by Prof. K.V.Thomas, Union Minister of State for Food, Consumer Affairs & Public Distribution, eminent personalities from the advertising, media, consumer groups and the government. Prof. K.V.Thomas, while delivering the keynote address felt that the quasi judicial bodies formed under the Consumer Protection Act are not in a position to prosecute misleading advertisements suo moto. Further, these redressal bodies did not have any dedicated investigating organisation, he said. Unfortunately, Self Regulation had not succeeded in controlling unethical advertisements, said Prof. Thomas. He felt that the effectiveness of ASCI will be judged by its ability to prevent misleading advertisements from appearing in the media. Timeliness is essential for asserting the importance of the self regulating body, said Smt. Ambika Soni, Union Minister for Information & Broadcasting. She cautioned that in the absence of timely action, the damage caused to the public could not be offset. In this context she appreciated the initiative of the ASCI to introduce the 'Tatkal Scheme', for speedy disposal of complaints against misleading advertisements, within one week. Smt. Soni informed about the government's initiative to introduce FM radio stations to all towns with a population of 1 lakh. She said that there was a huge potential for advertisements and the growth of the media. She felt that the self regulating mechanism system should be strengthened to address the growing needs. 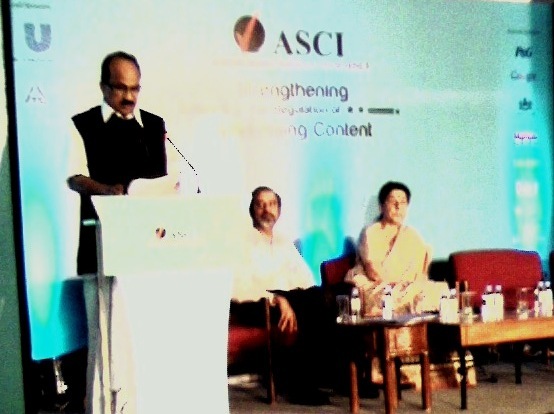 Sri I.Venkat, Chairman, ASCI, made a brief presentation about ASCI and the initiatives that it has taken to curb the misleading and unethical advertising menace. He pointed out that a single advertising standards covering different government departments would help the ASCI in better self regulation. He said that to minimise the lead time in handling the complaints against advertisements, ASCI had introduced a 'Tatkal Scheme', for processing the complaints within 1 week. Three Panel Discussions had been organised, as a part of the seminar, on Decency in Advertising, Honesty & Truthfulness in Advertising and Food & Beverages Advertising. All the sessions were addressed by experienced professionals and the sessions were quite interactive. The ASCI seminar was held on 17th November 2011, at the India Habitat Centre, New Delhi. Do U know about the CCC of ASCI ? The Consumer Complaints Council (CCC) of ASCI is the delivery mechanism against misleading and unethical advertisements. This group comprises of 21 people drawn from various disciplines. 12 are eminent people not associated with advertising (such as lawyers, doctors, journalists, technical experts, consumer activists, etc.) and 9 are from the industry (advertisers, media agencies, ad agencies, etc.) The complaints received are handled by this group in a systematic way and it directs the offending advertisement to be stopped forthwith and the decision is also communicated to the complainant.. There is of course, no provision for compensation payment. The main advantage is that there are no charges/fees and no need to appear in person, in contrast to the consumer courts. The Advertising Standards Council of India, 219, Bombay Market, 78, Tardeo Road, Mumbai-400034.